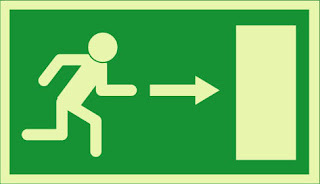 In Europe the above sign is used to show a fire exit. A young designer in London, Freddie Yauner, wondered what would a sign do if it was finished showing people the direction of the exit for the day. Take a look at this funny and entertaining answer at this link. Wait a second and watch the sign start its animation. Also check out his highest popping toaster in the world. Starting in the 1930’s life and death was shown through photography in the daily papers of the day. One of the best at this style of everyday life and death was Arthur Fellig, better known by the name Weegee. 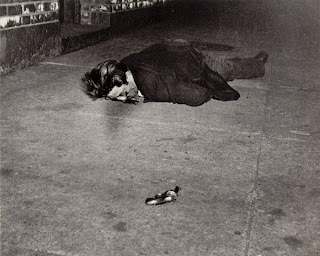 Weegee made his mark by being the first on the scene, taking the photo of the crime that had happened moments ago. The photos where honest and in your face. Many of his famous photos showed murders and the police heavy into investigating the crime. 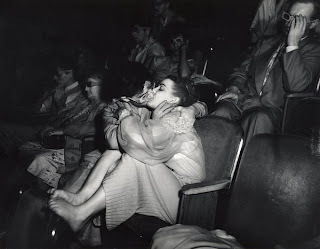 Weegee was also active in capturing everyday life and love on the hard streets of New York City. Weegee’s work is presented in numerous books and websites. To read more about Weegee, click here to check out a good article and slideshow in the New York Times. 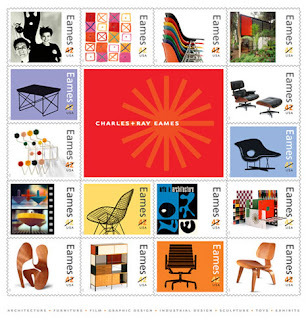 I blogged earlier this year about a series of stamps playing tribute to designers Ray and Charlies Eames. The post office started selling the stamps yesterday. Run to your post office and pick some up and show you are a designer on that next letter you send out. Take a look at this video if you are up in the air. Maybe it will help you with your vote in November. Check out the video here. 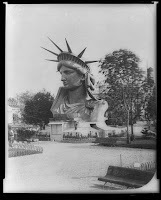 Today on June 17, 1885 The Statue of Liberty arrived in New York City. The statue orginially known at “Liberty Enlightening the World” was designed by French sculptor Frederic Auguste Bartholdi. The Statue of Liberty was a gift of friendship from the people of France to commemorate the Franco-American alliance during the American Revolution. 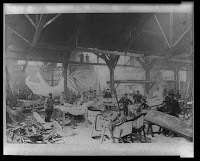 The statue arrived in over 200 cases and was reassembled on a pedestal inscribed with a poem by Emma Lazarus, "Give me your tired, your poor, Your huddled masses yearning to breathe free, / The wretched refuse of your teeming shore. / Send these, the homeless, tempest-tossed to me. / I lift my lamp beside the golden door." Bartholdi’s statue has become one of the United States most famous icons and a beautiful example of art and friendship. Yesterday evening marked the end of a long road towards a BS in graphic design and advertising for my portfolio students. 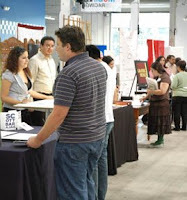 The Portfolio Show for the Art Institute of California - Orange County was a presentation of strong portfolios and years of hard work. I would like to wish my graphic and advertising students all the best in the future. You have completed a big step in your future and I hope you all have long careers in this great business we call design. Keep your passion and continue to have fun along the way. Good luck!! Carnegie Mellon University has a website devoted to a Swiss Poster Collection with more than 300 designs from the Swiss Poster of the Year competition. The exhibited work represents the periods from 1971 to present. 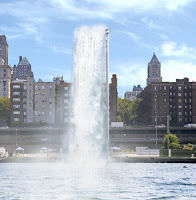 The collection is fully searchable and also listed in categories like fashion, theater, health and travel. 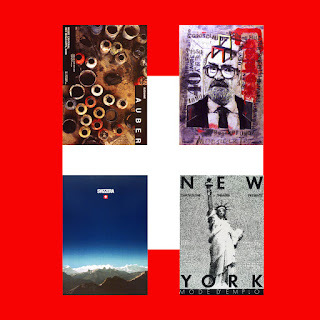 The collection is a wonderful look and reference of the evolution and expression of poster designs in Switzerland. To view the collection click here. Ready to take a test. 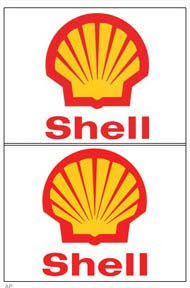 Give this logo quiz a try and see how good you are. 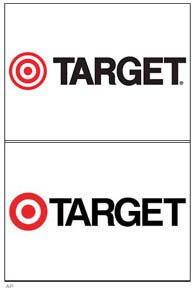 Can you pick the real one from the fake? If you score well you could get a job at Customs stopping counterfeit products from entering the country. Click here to give it a shot. 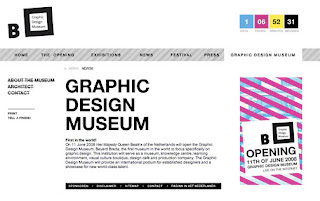 The first museum dedicated to graphic design will open tomorrow in the Netherlands. The grand opening will be hosted by Her Majesty Queen Beatrix of the Netherlands. If you are heading to the Netherlands in the near future I would put this on your visit list along with the many wonderful sights found in the Netherlands. To view the site for the museum click here. 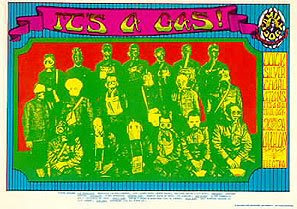 Alton Kelley is best known for his graphic design of rock psychedelic concert posters during the 60s. 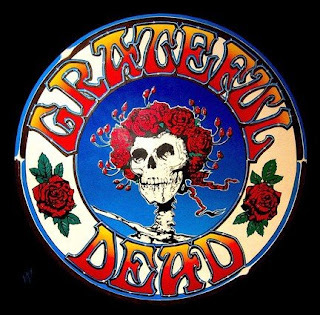 Alton along with his longtime collaborator, Stanley Mouse, created some of the most memorable posters of the era for the likes of the Grateful Dead and Jimi Hendrix. To view an obituary by the NY Times click here. 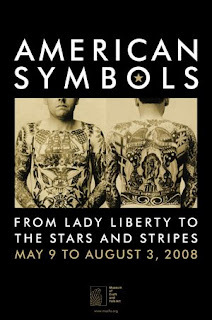 The Museum of Craft and Folk Art in San Francisco is showing American Symbols: From Lady Liberty to the Stars and Stripes. This show explores the collection of Kit Hinrichs the renowned graphic designer and partner at Pentagram, San Francisco. The collection consists of a graphical history of the flag and seal of the USA as its used in design, folk art and craft. 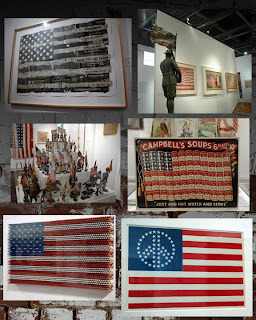 This intriguing collection of objects shows America from the patriotic such as flag quilts to the commercial with Campbell’s Soups advertising. Celebration and pride are show along with period of protest through the symbols of Americana. Kit’s collection is wonderful to observe and shows the many mediums that are used to show the symbols of America over time. If you are in the San Francisco area go check out this exhibit. It is showing now until August 3 at the MOCFA. I was recently back up in San Francisco for the weekend. What a beautiful city. I explored the Ferry Building this time. I found numerous small food stores within. This I expected but the unexpected was a beautiful renovation of this historic building. From a graphics point of view, I saw these wonderful signs for each of the shops. 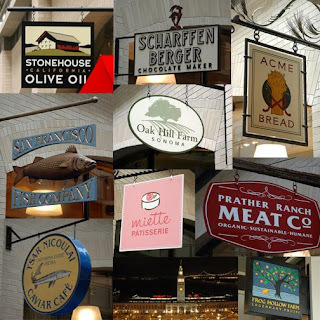 The signs where all well designed and hung above the portals of the stores. Each one was individual and gregarious. If you get a chance to visit the Ferry Building in SF, make sure you look up. You will be happy with the signs from above.